By Daniel A. Lane, Ph.D., Member, Lee Enterprises Consulting, Inc.
At its most basic level, technoeconomic analysis or assessment (TEA) is a cost-benefit comparison tool used to evaluate the commercial viability of a process. While many companies are quite familiar with this tool, a number of startups often forgo TEAs of their processes until quite late in the development timeline, which can be a fatal mistake. Considering the TEA early – and often – during process development can highlight future problems early, can provide due diligence to prospective investors and partners, and can help prepare for a successful scale-up effort. In this article, I will demonstrate the value of using TEAs not just to determine commercial viability, but to focus and to direct R&D efforts, and to improve the likelihood of a successful scale-up. Technoeconomic analysis utilizes a blend of technical modeling, engineering design, and economic evaluation to produce a meaningful result that qualifies – and can be used to quantify – the commercial viability of a process. A typical methodology is to produce a mass and energy balance of the process, then create a preliminary facility design that identifies and sizes major equipment. From the mass and energy balance and the facility design, information such as capital costs, operating costs, and financial performance of the overall process can be determined, thereby allowing a detailed economic evaluation of the proposed venture (see Figure 1 below). In order to glean the most value from TEAs, it’s necessary to have a solid understanding of what they can and cannot do. TEAs, while powerful, do not consider everything needed to properly evaluate a process. For example, while TEAs offer the opportunity to determine carbon utilization efficiency, they do not consider environmental impacts and permitting. While TEAs do not include market analyses, they can be used for go/no-go decision making based on detailed market analyses. As with any tool, the value of the result depends significantly on the quality of the information fed into it. In addition to the M&E, a process design is required to deal with items like equipment selection/sizing and utility consumption. At the early stages of a process, it may be necessary to make assumptions for equipment selection, but it is still a required part of the TEA. The –economicportion of the TEA takes as inputs many items that are determined from the output of the techno-part. For example, capital costs are determined by equipment sizing and selection, which is in turn based on the mass balance and process design. Operating costs are generated both from the M&E and the process design (e.g. feedstock and utility consumption). In addition, this part should also include indirect and direct construction costs (e.g. planning, consulting, EPC, freight, taxes, etc.) as well as financial variables such as cost of capital, tax rate, and debt-to-equity ratio. The outputs of the TEA typically include estimates of the total fixed capital investment, annual operating costs, insurance costs, and cash flow analysis. Investment metrics are also produced: With a fixed cost of capital, payback period and net present value of the investment can be estimated; with NPV set to zero, the internal rate of return can be estimated. One last thing to note about TEAs is that the techno-part by itself can add value to an organization performing process and technology development. While an assessment of commercial viability requires more, even a preliminary M&E can highlight potential problems or opportunities such as co-product generation or utility requirements at larger than laboratory scale. Early stage startup companies are often looking to develop their technology at the same time as they are looking for funding to continue operations. Without an established product on the market, the lack of revenues squeezes the R&D function and limits resources significantly. To avoid throwing money away by continuing operations without a viable technology, the first question the organization must answer is, “Will this even make money?” It’s common to hear the ‘better mousetrap’ metaphor as a driving force for innovation, but how can an organization determine whether people will actually pay for that mousetrap? Preliminary TEAs can help answer this question be providing an estimate of the cost to produce said mousetrap, which can then be considered relative to a market analysis. If the cost looks too high versus the existing market, the TEA can be used to estimate decreasing costs with increasing scale. One of the major reasons I’ve heard for early-stage companies not performing TEAs is a lack of detailed knowledge of the technology or the process to complete one. Certainly, preliminary TEAs must rely on quite a few assumptions, but a key benefit of this is that it forces startups to make them. Just the act of making and questioning the validity of an assumption can awaken the realization that there is additional work for the R&D pipeline early enough that there is time to work on it. At this point, anything that can accelerate the path through the ‘valley of death’ is worth pursuing. And speaking of financing, a final note about early stage usage of TEAs: Government granting agencies love to see TEAs. I once had a client that was very early stage, working on angel investor funds out of an incubator to improve their fermentation process to produce a novel biomaterial. Looking forward toward a Series A funding round, they wanted a TEA to show profitability of their process at commercial scale, so they could take it to potential investors. In the course of creating the TEA, I incorporated rate, yield, and titer variability into the mass balance. While reviewing the model with my client, I was able to demonstrate that while they had made significant progress on increasing their fermentation yield, both rate and titer were low enough that huge fermenters would be required to make any reasonable amount of material, and therefore their capital costs were huge, as well. By varying these parameters in the model, I could show their impact on capital costs. With this information, they shifted R&D resources to focus on increasing rate and titer and within a year had improved sufficiently to secure the funding they were pursuing. The pilot plant is complete and has been running successfully for 1000+ hours and the overall process design is well established. The pilot plant is fully integrated, includes feedstock handling, and even includes product packaging. The technology is proven, from tip to tail. At this point, the TEA becomes much more a financial tool, since the techno-part of it is effectively set in stone. However, as a financial tool, it is still extremely useful and is worth updating. Updating stoichiometry, utility consumption, production variables, etc. with validated data will enable a much more rigorous analysis of commercial-scale production. In addition to helping to secure financing, the TEA will also provide information needed to apply for permits and negotiate off-take agreements, waste handling contracts, and utility contracts. More importantly, a rigorous TEA will help determine whether scale-up from demo should be modular or scaled. For startups that are looking at that first product going to market, all of this information is critical to getting through the “valley of death” quickly. For well-established large corporations, it may be less critical – they’re on the other side of that valley – but even the largest companies have limited capital availability, and a solid TEA can help with project selection. Although business development means something different to an angel-funded startup than to a publicly-traded company with a $100MM market cap, it is always easier to perform with a solid TEA as support. Finding investors or joint venture partners requires showing profitability, commercial viability, and a detailed commercialization plan, all of which are far easier to do with a TEA. As mentioned above, profitability and commercial viability are outputs that rely in part on scaling the process until the desired result can be obtained. A good TEA is tightly linked to the process model and the M&E balance, so updates to scale propagate through the model and produce updated financial results. 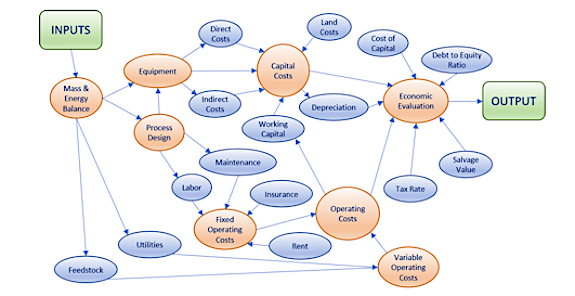 It can be difficult to quickly account for the resultant changes in capital cost, but things like scaling functions for equipment cost estimation can provide rapid estimates of equipment costs and thus allow for rapid updates to the financial model. This in turn allows for rapid completion of sensitivity analyses that can show the impact of various items such as capital cost, feedstock cost, utility cost, tax rate, and production scale on financial metrics such as NPV, IRR, or payback period. An updated TEA is an essential tool for successful business development. Humbird, D., Davis, R., Tao, L., Kinchin, C., Hsu, D., Aden, A., . . . Dudgeon, D. (2011). Process Design and Economics for Biochemical Conversion of Lignocellulosic Biomass to Ethanol. Golden, Colorado: National Renewable Energy Laboratory. 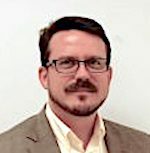 Dr. Daniel Lane, Principal of Saille Consulting, is a member of Lee Enterprises Consulting, the world’s premier bioeconomy consulting group, with more than 100 consultants and experts worldwide who collaborate on interdisciplinary projects, including the types discussed in this article. The opinions expressed herein are those of the author, and do not necessarily express the views of Lee Enterprises Consulting.